We’re not stick men and women! When we’re very young we draw stick men and women. Even as children we know they’re not how we actually are, but they’re nice and simple and just drawings after all. As we grow up and go through enormous physical changes. Our legs, arms, spine – well everything – grow at different rates and ages, which can make us quite clumsy as teenagers. Thankfully the changes usually level off once we’re in our twenties. In the process we can become quite disconnected from our bodies, and we may not fully update our stick man drawings of ourselves once things plateau. The effect can be for us to do things with our bodies differently to how they actually are designed. Let’s look at the sketches to get explain. The sketches on the left there’s no neck and no width to the torso across the shoulders or the hips. It’s like they’re less than two dimensional, nearing one dimension! Imagine trying to walk with the idea that our legs join our torsos at a single point on our spine. Or when we’re sitting, the idea of balancing on the tip of a pencil, having to hold ourselves up as we feel we’re about to topple over. Here’s a little experiment for you. 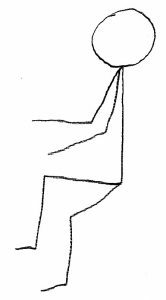 Sit down and imagine that you are actually balancing on the bottom of your spine, with your legs joining there too, like in the sketch. How do you feel with this thought? How stable are you? Are you holding your breath? How true does this feel? Is there anything else you’re noticing? Moving to the right of the sketches, I refined my chirpy chappy by kindly giving him a neck and curved hips. It’s still very rudimentary but he’s starting to fill out a bit. In the far right drawing I added circles for where there are major joints are. These refinements in effect add a collar bone across top of the chest and the legs join the hips which connect to the spine. The figure is now two Dimensional. 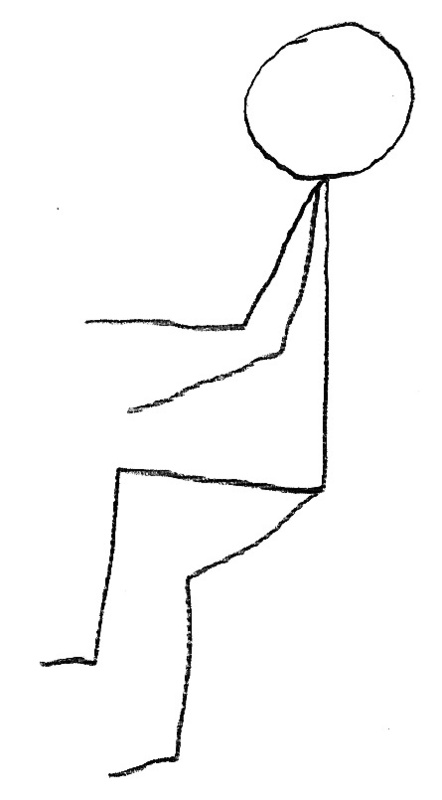 Notice I’ve drawn the feet with the heels slightly behind the ankle joint, so the toes are coming forward in space and the heels back, which hints to the third dimension. Again sit down and notice what part of your hips is supporting you on the chair. You may want to ‘sit on your hands’ to feel the bones pressing through, to make it easier. There’s a distance between those two bones, about the length of your index finger. So it’s not a point you’re balancing on, but more of a structure with width. How do you feel having this support? How stable are you? Are you breathing differently? Is there anything else you’re noticing? Go back to thinking that it is just the bottom of the spine supporting you and notice any differences with how you are. Stay with that a moment. We all have an unconscious map of the relationship between all our body’s parts, which science calls a schema. It’s made up of all the information that pours into our brains and throughout our nervous systems. These comes from our sense organs, but also from the nerves sending the ever changing state of tension of our hundreds of muscles. However, if our body map is wrong, like when we think our legs join our torsos at a point like on the basic stick man, it can really effect the way we use ourselves. Doing this experiments above may have given you an insight into this. Look at the bones of the hips to the right, to find out where the sitting bones are that are supporting you. They’re part of the hip bones, which are the biggest bones in our body. 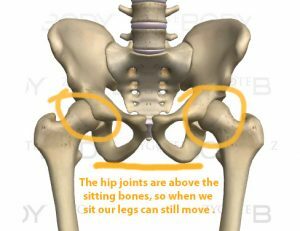 Notice how the hip joints are above the sitting bones, so our legs are free to move, even when we’re sitting. Our bodies are very obliging, they obediently try and do what we tell them, however awkward or bizarre. So, the better our body map, the easier our bodies can carry out our requests (and demands!). When we actually start looking at a skeleton we can start to get to know ourselves, both it’s limitations but also it’s amazing possibilities. In the 2nd workshop of the course starting on 8th March, I’ll to give you a chance to experience your body maps, and to start updating them as necessary. Looking at a skeleton is one thing, but integrating that knowledge into our of bodies can really empower. We can have more confidence in our bodies, by directly experiencing how our skeleton is capable of supporting us, muscles moving us and everything coming together to adapt to all the activities we want to achieve. On my courses this is all done through fun, simple games and exercises. Come along at 7:30pm on Wednesday and find out about your self, for yourself! To book a place, use the PayPal button on the courses page, or contact me if you’d like more information. A nice little activity to find out about how we’re put together, is to learn to draw stick men and women. You find out about how we’re proportioned and where our joints are. What I unearthed when finally learning to touch type. I’ve been in hibernation over the winter, which has given me time to try something I’ve been wanting to learn for a while. Yes, of all the things that could’ve captured my attention! I realised that I type a lot; emails; notes; research etc etc. So, to learn how to type more efficiently would be handy. I’ve tried to learn to touch type a few times over the years, but recently I found https://www.typingclub.com/ a great free training website. I let myself become a total beginner again, and start at lesson 1. It meant I only typed with my index fingers on ‘f’ and ‘j’, aligned to the little notches on those keys. I let myself go along with the training programme the site offered, not trying to second guess what level I thought I should start on. It felt a bit silly, as I was saying to myself that I can already type, so I should be starting somewhere else, but I wasn’t clear where, of course. Over the years I developed my own special way of typing, using the classic index finger technique, poking and prodding the keys, moving on to my ‘non-standard’ touch typing style. This time I put my pride to the side and just followed each lesson, with new keys being progressively introduced. Interestingly, a few lessons in, I realised that I didn’t have to move my fingers or hands (or shoulders!) very much to type. I noticed my fingers were tapping away at the exercise and I wasn’t really thinking about what I was doing with my fingers, they were almost doing it themselves! Other times though I’d crash and burn and get in a right mess. What I also started to notice was how I ‘d tense up and become slightly contorted when I was struggling. I’d get frustrated and started to consider giving up. But then other times it flowed easily and I’d stay more balanced and less stressed. I was getting to know how I habitually react to stress. Now I must come clean, I teach the Alexander Technique and it has some great tools to unearth some little nuggets of information. I can bring awareness to myself, start noticing my habitual patterns and begin to develop new more beneficial habits. Bringing it into the everyday. Now, I wouldn’t say I’m a touch typist, but I’m much further down that road. When I’m typing notes, emails and blog posts! I can bring this awareness to the activity and sprinkle some Alexander ideas, and notice how things change – if they change. 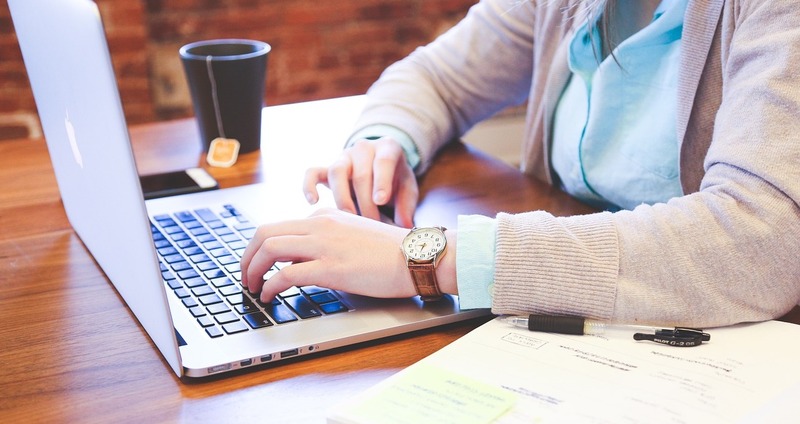 Using the touch typing site was a handy way to just practise typing, without worrying about what I was writing, so it was a bit easier to pay attention to what I was doing with my mind and body in that activity. Which brings me to the disclaimer: Touch typing isn’t essential to having a happy and successful life. But it was something I was into learning and in the process I opened up some space to learn about myself. And that’s a handy thing. I’m running a new short course in Tottenham starting on the 8th March exploring the basic ideas of Alexander’s discovery, through games and fun experiments. If you’d like to come, you can book a place here. Or contact me for more information. Give the Typing Club a go, and let me know how you get on, or feel free to write a comment below. Work takes so many forms and we all bring our own uniqueness to each activity. Looking at the montage of people below, we can see a very diverse set of activities. We may be able to recognise our own patterns in some of what these people are doing. Looking at photos of others in activity is a useful way to become aware of how we do things. We invariably get so caught up in what we’re doing, that it’s not until we’re in pain, do we become aware of how we’re actually doing something!! There’s one activity in the montage that I doubt very much anyone reading this will be doing. The woman sitting with a large tube on a stand in front of her. No, she’s not preparing for her next plumbing project, or a developing a free-energy machine. 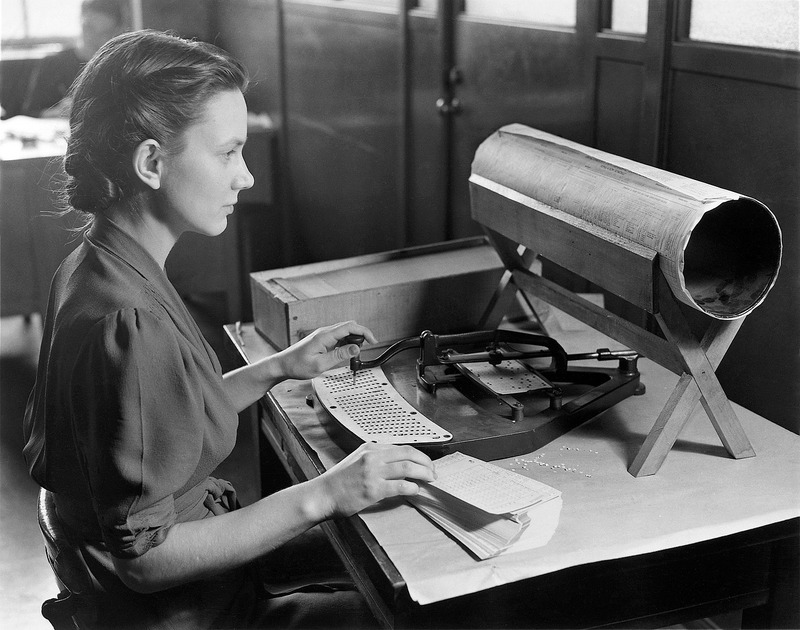 It’s actually a punched card operator for US census cerca 1940!! Back before even keyboards. It’s interesting to see how the woman looks quite well poised, despite the crazy repetition of the task and level of detail needed. Just looking at these pictures, you may be changing how you’re sitting or holding your mobile device. It’s like we’re wired to relate what we experience in the world to ourselves. It could be said that what we experience through thoughts, actually manifest in the body, a synergy. 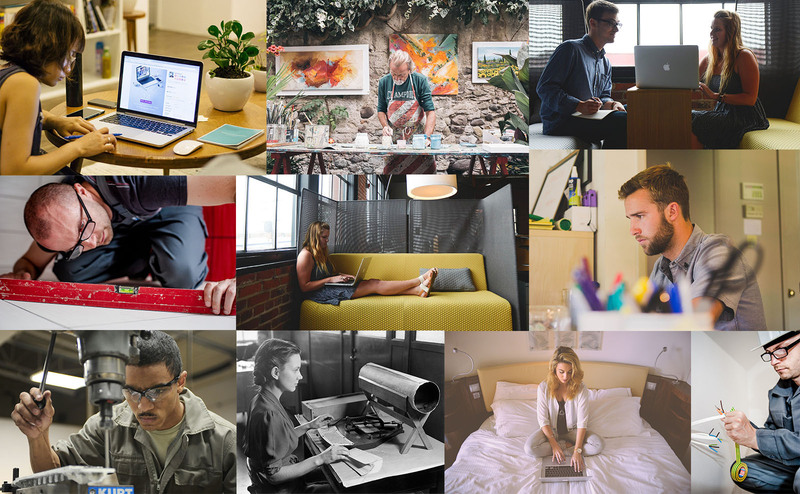 I’m starting a series of introductory courses looking at improving your Work-Posture Balance. The first one will be running for 3 weeks from the 17th February, then on the 9th March. Check out Courses for more details. Images from the Pixabay website under Creative Commons CC license. Receive new blog posts, news on courses and tips for a life with more ease! A total of 517 people with chronic non-specific neck pain participated in a scientific trial. Both Alexander Technique lessons and acupuncture sessions led to statistically significant and clinically relevant reductions in neck pain and associated disability, compared with usual care alone, at 1 year. Long term benefits for Back Pain Sufferers. A major scientific study, published in the British Medical Journal, found that out of the 579 participants, one to one lessons in the Alexander technique have long term benefits for patients with chronic low back pain.